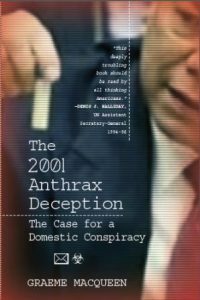 MacQueen is author of the book The 2001 Anthrax Deception and founder of the Centre for Peace Studies at McMaster University in Ontario. He said today: “The closest parallel to the recent suspicious packages are the anthrax letter attacks that occurred in the fall of 2001. There was wildly inaccurate reporting immediately after that case, and for this reason we should reflect on what we have learned about the anthrax attacks. “The attacks were initially blamed by most people on Al Qaeda, not surprisingly given the written letters that accompanied the anthrax (‘Death to America, Death to Israel, Allah is Great’) and given that the letters came so soon after the 9/11 attacks. As the fall went on politicians and members of the media went further and suggested that Iraq was Al Qaeda’s sponsor. The attacks were then used to support invasions of both Afghanistan and Iraq. “The anthrax attacks were also used to ensure passage of the Patriot Act and to silence its critics. Two of its leading critics, both of whom were Democratic senators, received anthrax letters. “By the end of 2001 this entire Al Qaeda-Iraq scenario had collapsed, and it was increasingly recognized, by the FBI, Homeland Security, and the White House that the attacks had been deceptive. Muslims now appeared to have had nothing to do with the attacks. The anthrax spores had evidently come from one of three highly secure labs in the U.S. at the heart of the military-industrial complex. This was, therefore, not only a domestic operation but an operation launched from within the U.S. security apparatus. It had evidently been mounted to frame Muslims and promote the War on Terror. “Controversy remains today over who the perpetrators were. The FBI claims to have solved the case and identified an unstable ‘lone wolf’ scientist (Dr. Bruce Ivins) working at the the U.S. Army Medical Research Institute of Infectious Diseases in Frederick, Maryland. But there are very strong reasons to believe Ivins was not the culprit and that the team of perpetrator-insiders is still at large. Also see: “Anthrax Mystery: Questions Raised over Whether Government Is Framing Dead Army Scientist for 2001 Attacks” on “Democracy Now!” in 2008 with Glenn Greenwald and Dr. Meryl Nass, expert on anthrax and editor of the blog AnthraxVaccine.blogspot.com. Also see Greenwald’s piece “Vital unresolved anthrax questions and ABC News,” which examines how major media outlets protected anonymous sources who disinformed the public.